"The Cowan Center is a remarkably special place. The faculty and staff are not only caring, wonderful people, but they are educators at heart. The safe environment they create is the background to a culture that fosters a love of learning and personal growth." Founded in 1991, the Cowan Center is a preschool and childcare program with the primary mission of providing childcare and education for the children of Greenwich Academy faculty and staff. Faculty children from other area independent schools and children from the local community are admitted as space permits. The Cowan Center is located on the campus of Greenwich Academy, which allows a wide variety of activities and experiences to be part of each child’s daily routine. Housed in an antique carriage house, the Cowan Center is a modern facility that retains the feeling of home. In addition to the Greenwich Academy campus facilities, the center is surrounded by three playgrounds, which offer children abundant opportunity for outdoor play and exploration. The Infant Group has a staff-child ratio of 1:3 with a group size no larger than 6–8 infants. The Toddler Group has a staff-child ratio of 1:4 with a group size of 8. 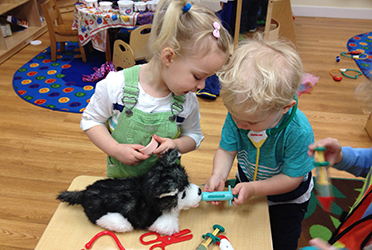 Preschool children learn and play in groups of 12–16 with a staff-to-child ratio of 1:6–8. Cowan Center teachers are members of the faculty of Greenwich Academy and share the values that are the hallmarks of teaching excellence: collaboration, innovation, professional growth and a strong commitment to the care and education of young children. The Cowan Center provides a safe, nurturing and stimulating environment where each child is appreciated as an individual who possesses unique abilities and talents. We recognize that the early years of a child’s life are characterized by rapid change. Teachers value the wide variations in normal development and plan for individual growth within the group setting. Teachers in the Infant Program foster development by responding to each infant’s needs promptly, consistently and lovingly. Each child’s personal schedule is followed as closely as possible. 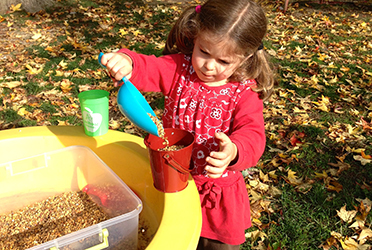 The Toddler Program encourages self-help skills and independence. Toddlers are encouraged to identify emotions and respond appropriately. Language growth and the continued support of the child’s natural curiosity are of primary importance. The Toddler Program maintains a predictable daily schedule to support the toddler’s love of routine. The Preschool Program marks the introduction of preacademic skills that will help the child transition to elementary school. There is a continued emphasis on developing curious, capable learners. The Cowan Center recognizes and supports the family as the primary influence on each child’s development. The Center welcomes and encourages a partnership with parents and strives to maintain shared goals with the family. Parents may participate in the Cowan Center Parents Association (CCPA). The CCPA sponsors events for parents and families including a parent breakfast, a speaker, a fundraising event and a spring picnic. Music, movement, conversational Spanish and science are included in the curriculum. Children in the morning preschool class may participate in the Lunch Bunch program that extends their day until 12:00 PM; and Afternoons at the Cowan Center that concludes at 2:00 PM. The Cowan Center follows the Greenwich Academy calendar and is closed when Greenwich Academy is not in session. Enrollment in the Cowan Center does not constitute admission to Greenwich Academy or entitle a child to any preference for consideration for admission to Greenwich Academy. The Cowan Center does not discriminate on the basis of race, color, religion, national origin or sexual orientation in the administration of its educational programs, admission policies or any other school administered programs.